What is indirect comparison? | Whatis Series...? 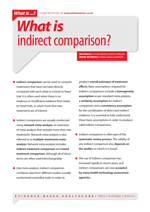 Indirect comparison can be used to compare treatments that have not been directly compared with each other in a head-to-head trial. It is often used when there is no evidence or insufficient evidence from head-to-head trials, or when more than two treatments are of interest. Network meta-analysis includes indirect treatment comparison and mixed treatment comparison, although all of these terms are often used interchangeably.